Unleash your inner Latin with these powerful steel shell timbales and innovative plywood shell bongos. 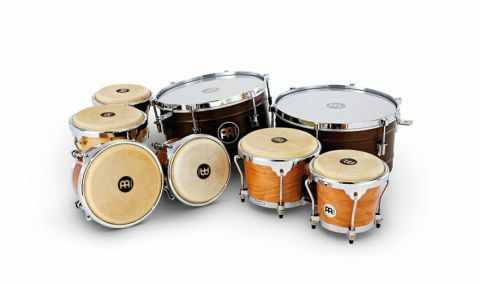 Marathon timbales and RAPC bongos are reasonably mid-priced with a good choice of attractive finishes. Innovative design. Airy tones. Easy tuning. The German company Meinl is unique amongst the major manufacturers in producing equally broad ranges of both cymbals and percussion instruments. Adding to Meinl's already generous bongo offerings are these innovative RAPC series bongos. "Bongos, like congas, are traditionally made from thick staved shells, so this 'radial ply' is an interesting departure"
These three bongo pairs are all from Meinl's new Radial Ply Construction (RAPC) line. Patented in Germany, what distinguishes the RAPC is the plywood shells of poplar. Bongos, like congas, are traditionally made from thick staved shells, so this 'radial ply' is an interesting departure. At five plies and 7mm the shells remain traditionally thick (for such small drums) and they taper in towards their bases like classic bongos. The poplar is overlaid with a choice of five veneered finishes. We have three - High Gloss Cherry and Bubinga, plus Matte Desert (Mapa) Burl. Remaining choices are High Gloss Ebony Black and Black Maple Burst. All three review drums look attractive, with the matte burl being the most unusual finish but also the most expensive. Also patented is Meinl's Free Ride Suspension System which consists of a thick chromed steel bridge joining the two bongos together by their bottom hoops. This means that unlike most bongos there is no wooden block fixing the two shells together in the middle. The shells remain undrilled and free to resonate better and independently. This bridge also has two strong bolts which can be used to attach to Meinl's bongo stand if you wish to play the bongos standing up as part of a multi-percussion set-up. The 2.5mm Safe and Sound (SSR) chromed steel rims are especially curvaceous and nicely in proportion with the curve of the bearing edges. Compared with normal solid stave shells, we found the radial ply poplar shells equally resonant, but somehow a little looser and airier. No doubt this is amplified by the effective Free Ride Suspension System which ensures the macho and hembra sound quite separate and autonomous. Tuning of the tough 8mm lugs is quick and easy, especially if you use Meinl's handy key. The head tone is bright - the so-called 'True Skin Cow Heads' lack the thick creamy tone of calf, but instead are pingy and cutting. The Safe and Sound (SSR) rims have well-rounded edges for comfortable playing. You can really go for it safe in the knowledge you are not going to rag your sensitive fingers on any nasty protruding bits of steel.